Christmas is near, counting down to 23 days to be precise! This would probably be my last post for the year as we prepare for Christmas holidays and celebrations! Before I go off for the celebration, here is one last card I would like to share on my blog today. And here is Warmest Wishes from Curly. I blended some distress inks for the background to create a night sky and the greenish ground with some of my favourite distress ink blending. And I added (again) the enamel dots from Ranger accents to create the falling snow. 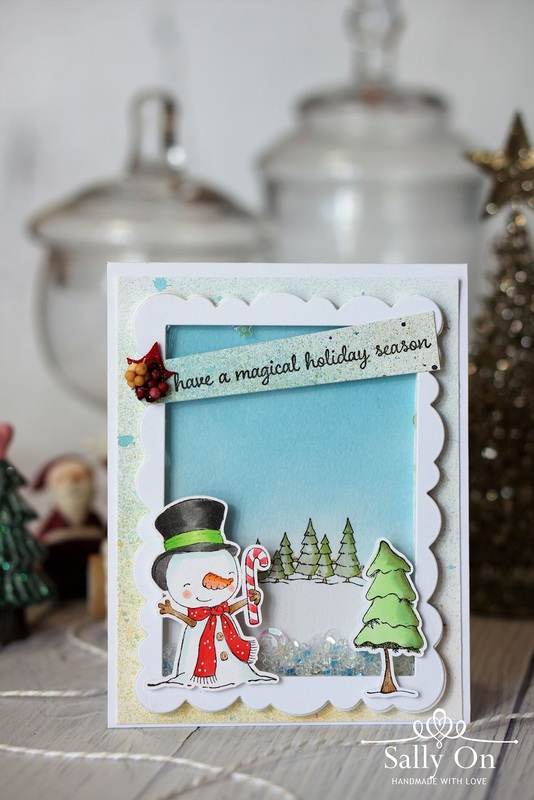 There are many ways to mimic the snowy sky of winter but I particularly love how the enamel dots will give a slight 3D effects to the card. You may ponder why the Cocoa Stand image has such a detail cut with the inside of the stamped image. I used the PixScan function from Silhouette Cameo software to help with the cutting and I particularly love this function as it gives a more detailed cutting that the Brother ScanNCut machine. I coloured Curly and the Cocoa Stand with my Copic markers and adhere to the card base with some foam dots. And to finish off the card, I added a very apt sentiment from the Sweetest Season sentiment set ~ Warmest Wishes! With every cup of hot cocoa served from the Cocoa Stand, it comes with the warmest wishes from Curly! That is all for now! Have a merry Christmas and a very happy new year!!! From today till 5 December, all stamps at Purple Onion Designs are at 25% off! 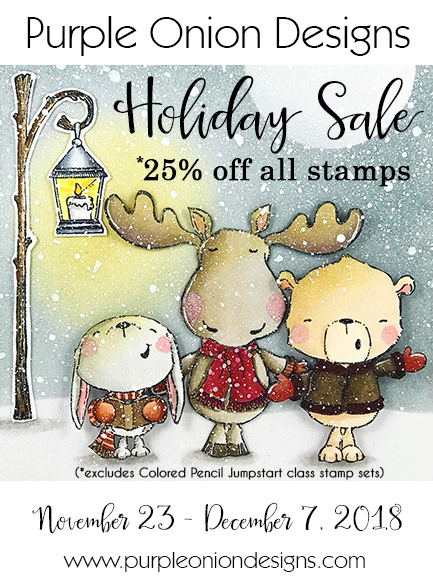 Now it's just the right time to get all the stamps that you've been eyeing on! 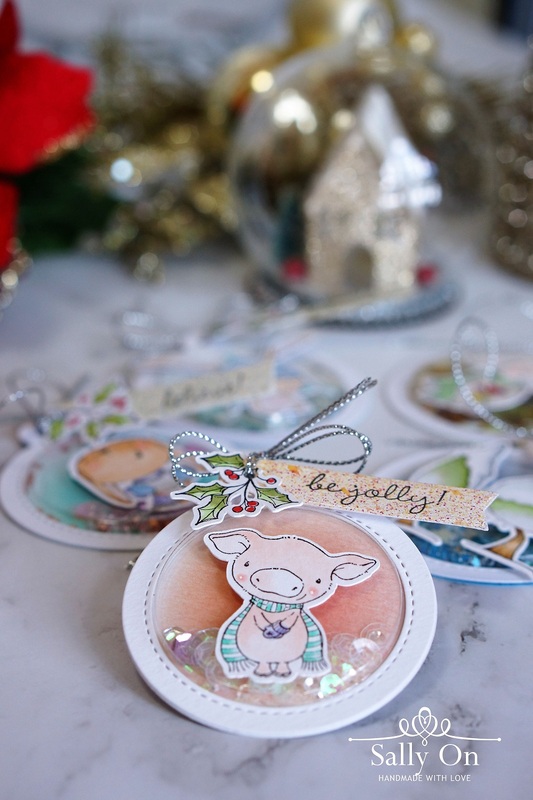 And here are some shaker Christmas tags I've made using some of my favourite Purple Onion Designs stamps. And here are some close-up pictures of the individual tags. 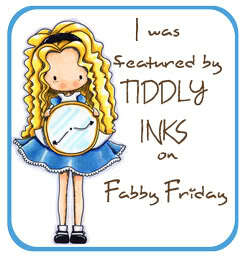 Using My Favorite Things Die-namics Tag Builder Blueprint 6, it's really easy to put the tags together. They even come with the right circle shaker pouches that is hassle-free! To add more colours to the shaker tags, I coloured some branches from Holly branch and I cut the portion of the image that I want to attach to each tag. Adding these shaker tags to your Christmas gift wrappings will definitely bring joy to the receiver with the added fun element! I hope you like what I've shared today. 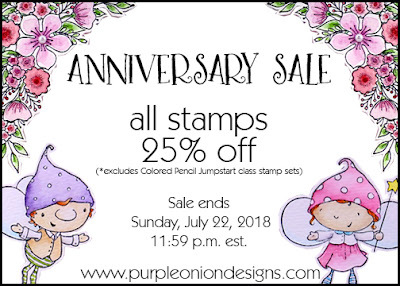 Don't forget to start shopping for your favourite stamps at Purple Onion Designs before the sales end! Sharing with you today is a shaker card I made using a new stamp from the Mistletoe Farm collection illustrated by Stacey Yacula, currently available on sale at Purple Onion Designs. Today will be the last day for the bundle sale of the full collection, sales is good till end of the day so go grab the collection before the offer is gone! It's been awhile since I last made a shaker card and it's always nice to make one for Christmas season. I picked sequins and beads with colours that resembles the snow so that it compliments the scene. So now you know why it's always fun to make shaker cards for Christmas! 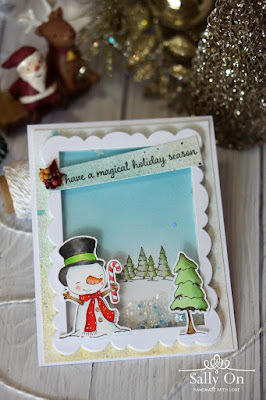 I stamped the images of Snowflake, and that one tree from snowy tree stamp, and farm horizon with my favourite Memento Tuxedo Black ink and colour them with my Copic markers. I also blended lightly some distress ink on the background of the farm horizon to have a nice blue winter sky. Instead of a rectangular normal frame, I used scallop frame from Avery Elle Wonky Scalloped frames elle-ments. I hope you like what I've shared today (: The sale will be ending in a couple of times so be sure to grab the collection before the offer ends! 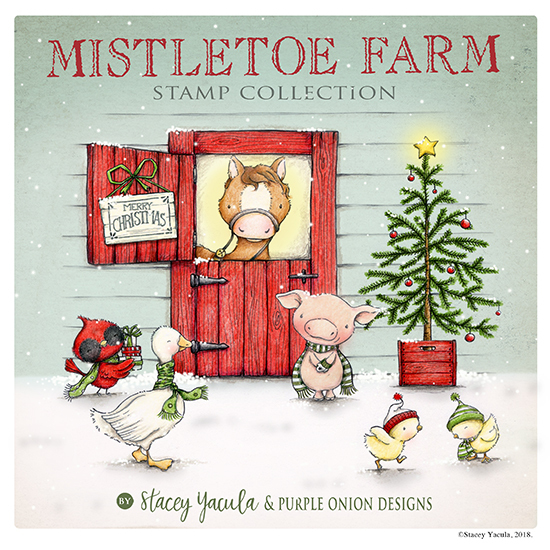 I'm back to share another card using some of the stamps from the new Mistletoe Farm collection illustrated by Stacey Yacula that was launch just last Friday at Purple Onion Designs! Have you check out the collection already? Hurry over and take a look now if you haven't as a sale is now going on for the complete set of Mistletoe farm. Selling at the discounted price of $107.00, it's a savings of 30% . More details here! Here is the card that I'll be sharing today! Stamps used: Ace, Pepper, Farm Horizon, Snowflake Grove sentiment set. 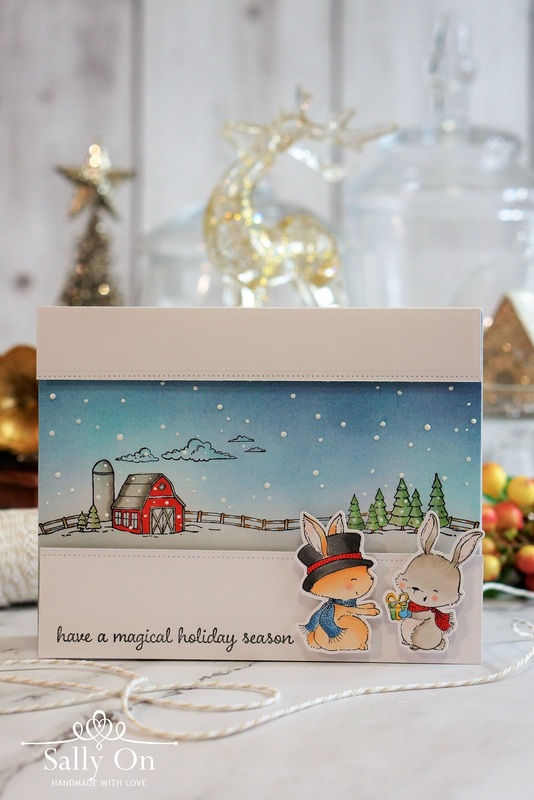 To create the snowy farm scene, I stamped Farm Horizon with my favourite black ink, Memento in Tuxedo black. I blended some distress ink to create the blue dark sky resembling nightfall and I coloured the rest of the images with my Copic markers. 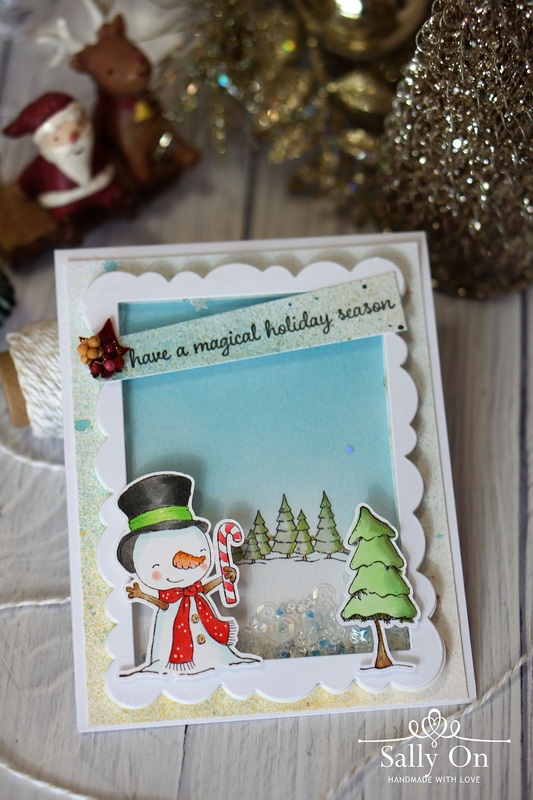 Again I used Ranger enamel accent in white glacier to add the random dots to create the falling snow. Notice how the little bumps formed by the Ranger enamel accents really added some dimensional details to the card, making it a little more interesting! Again I used Memento ink in Tuxedo Black and stamped Ace and Pepper on some Copic friendly cardstock and then I used the PixScan function from my Silhouette Cameo to have them cut out nicely and have them coloured with my Copic markers. Next, I cut the top and bottom panels with some cardstocks and added some dotted details at the edge using Lawn Fawn's Border die for the added details, stamped the sentiment on the lower panel and the card the almost done! Lastly, I adhere the top and lower panels for the card with Kokuyo Dot liner, and Ace and Pepper with some foam dots. I hope you like the card that I've shared today. If you like to see more inspiring projects using the stamps from the new Mistletoe Farm collection, just head over to the Purple Onion Design blog and I'm sure you will love what the Design team has to show! That's all for now! See you again in a couple of day's time! 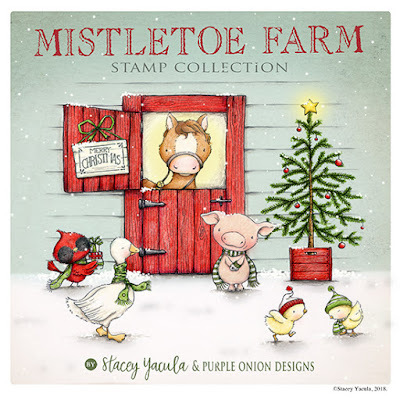 If you have been following my Instagram account, you would have seen the "coming soon" graphic that the new winter collection of stamps will be available from Purple Onion Designs that is illustrated by Stacey Yacula. Well, the wait is over! The new Mistletoe Farm collection is now available and for a limited period of time only, the whole collection will be sold at a $107.00 (at a 30% discount!). The collection consist of 26 stamps and offer ends on 31 October 2018. Mistletoe Farm collection, as usual, consists lots of new cute critters and this time round, it has lots of farm animals too! If you are a fan of Stacey Yacula, you wouldn't want to miss having this collection! 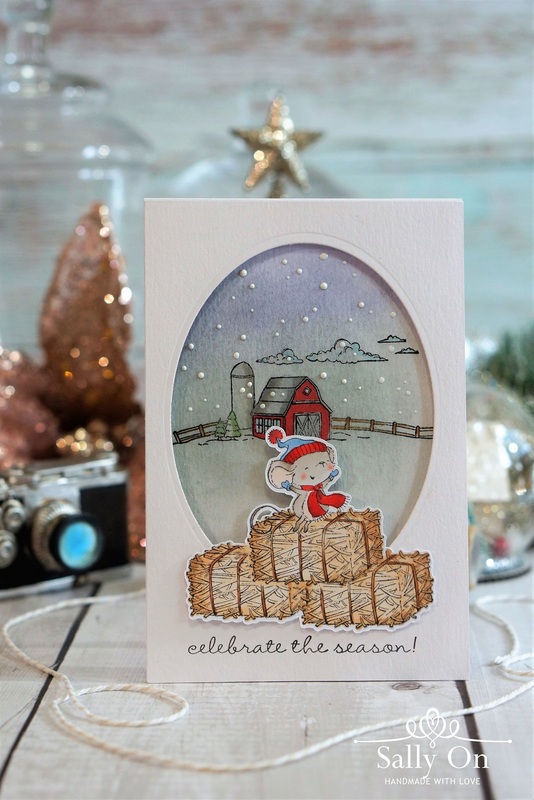 Stamps used: Maggie, Hay bale, farm horizon, winter wishes sentiments set. The idea of Maggie sitting on top of the stack of hay bale was from a random stamping fun (what I usually do when I explore new stamps) and when I saw how cute it was for her to be sitting on the top on the stack of hay bale, with her arms wide open embracing the falling snow, I really love how the whole scene look! Perfect expression for celebrating the season! I stamped a couple of hay bale on Inkadinkado stamping mask paper and then cut them out for the mask stamping technique to achieve the whole image. Here is a tutorial for the mask stamping to share. For the scene of the snowing farm, I stamped farm horizon on a water colour cardstock with my favourite ink, Black Tuxedo from Memento. I did some light blending using distress inks in chipped sapphire (for the sky) and iced spruce (for the snowy ground). I wanted the image of Maggie and the hay bale to pop so I keep the rest of the colouring subtle except for the barn house. Somehow the barn house looks prettier in red! To create the scene of the falling snow, I added little dots of Ranger enamel accents in Glacier white. I simply love how it gives the dimensional look when it dries, making the snow fall looking more realistic. 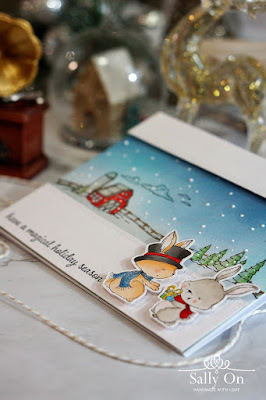 No card is complete without sentiment and I find "Celebrate the season" is just the right one for this card. 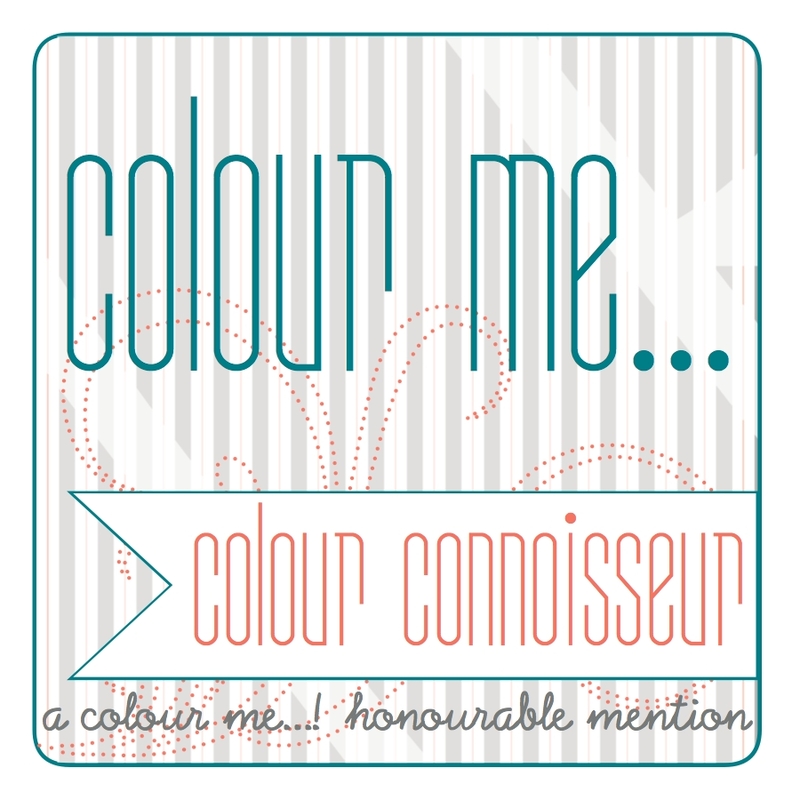 Remember to check back here in a couple of days as I will be sharing more projects using the new Mistletoe Collection. Sometimes a treat bag or a gift box just look a little to simple? That's how I feel when I wanted to pack a gift for a friend on her birthday.... and so I decided to make it look a little more fancy! The kraft paper treat bag is being cut out using my Silhouette Cameo. I then stamped the images with Versafine Onyx Black ink and colour them with Fabre Castell polychromo colour pencils. I stamped the image of Rosie first, and then cover it up securely with some mask stamping paper. Then I stamped the image of the wildflowers in the background all round the treat bag. If you have doubts on the masked stamping, just do a search on YouTube and you will find lots of tutorials to guide you on it. Colouring with the polychromo colour pencils didn't start off well for me, but it definitely got better after watching some very informative tutorials on the YouTube! My colouring is far from perfect but practice definitely helps loads! 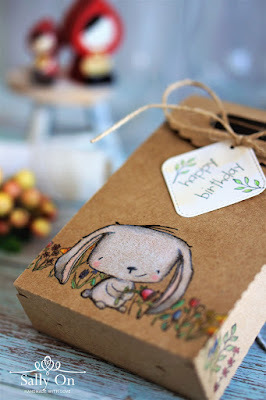 Even if it's just a normal plain paper bag, all these stamping and colouring can even be done. Just add a touch of stamping and colouring, or perhaps, if you have a little more time, make a gift tag and attach along, and the treat bag will look so much more interesting and lovely for a special occasion! Hope you like what I've shared today!